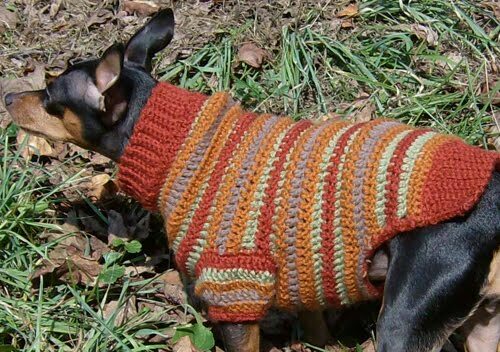 This cozy sweater striped in autumn colors has a ribbed neck and decorative ribbing on the back hem. Raglan-style sleeves narrow down to a close band to keep chills away. You can change the colors to any of your choosing for different looks. Note: Change colors BEFORE the ch 3 at the end of each row. 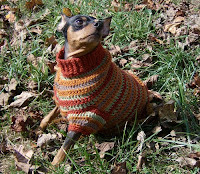 Stitch counts are written for an average size min pin. 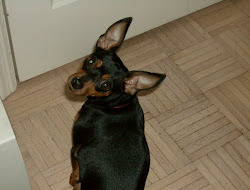 Numbers in parentheses allow a little extra room if your min pin is a bit pudgy. If you'd rather have this pattern in PDF form, click Autumn Sweater PDF. Using MC and smaller hook, chain 8 loosely. Row 1: Sc in 2nd ch from hook and each chain across. 7 sts. Ch 1, turn. Row 2: Sc in back loop only of each sc across. Ch 1, turn. Repeat prev row 44 (46) times. On last row, don't make the ch 1. Don't end off. Switch to larger hook. 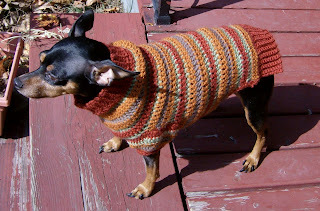 Begin making stripes using pattern above. Joining row: Ch 3 for first dc. Make 49 (53) dc along the long side of the neck piece. 50 (54) sts. Ch 3, turn. Row 1: Dc in first stitch, inc made. Dc in each dc across to last stitch, 2 dc in last dc, inc made. 52 (56) sts. Ch 3, turn. Rows 2 – 7: Repeat Row 1. 64 (68) sts. Don't end off. Row 1: Skip first dc. Dc in next 7 (9) dc. 8 (10) sts. Ch 3, turn. Leave the rest of the row unworked. Row 2: Skip first dc. Dc in each dc to end of row. Ch 3, turn. Rows 3 – 5: Repeat Row 2. On last row, don't make ch 3. End off. Go back to unworked stitches from first row of the leg hole. Skip the next 7 (7) stitches after the leg hole piece and join the yarn to the row. Row 1: Ch 3 for first dc, dc in next 33 dc. 34 (34) sts. Ch 3, turn. Leave the rest of the row unworked. Row 3 – 5: Repeat Row 2. On last row, don't make ch 3. End off. Go back to unworked stitches from first row of the leg hole. Skip the next 7 (7) stitches after the upper back part and join the yarn to the row. Row 1: Ch 3. Dc in remaining 7 (9) dc. 8 (10) sts. Ch 3, turn. Rows 3 – 5: Repeat Row 2. You will end at the edge of the work. Don't end off. Row 1: Skip first dc. Dc in each dc along second leg hole. Loosely ch 7. Dc in each dc across upper back section. Loosely ch 7. Dc in each dc on first leg hole. Ch 3, turn. Row 2: Skip first dc. Dc in each dc and ch across. 62 (66) sts. Ch 3, turn. Row 3: Skip first dc. Dc in each dc across. Ch 3, turn. Repeat Row 3 until piece measures 3 ½ inches from the bottom of the leg hole to the last row worked. Don't end off. Row 1: Slip st in next 15 (15) dc. Ch 3. Dc in next 31 (35) dc. 32 (36) sts. Ch 3, turn. You should have 15 dc remaining unworked for the row. Row 2: Skip first dc. Dc2tog, dc in each dc across to second to last dc, dc2tog. 30 (34) sts. Ch 3, turn. Row 3: Repeat Row 2. 28 (32) sts. Row 4: Skip first dc. Dc in each dc across. Ch 3, turn. Row 5 – 6: Repeat Row 4. End off. With MC and smaller hook, ch 10 loosely. Row 1: Sc in 2nd ch from hook and each chain across. 9 sts. Ch 1, turn. Repeat prev row 25 (27) times or until length of ribbing matches the length of the lower back hem. On last row, don't make the ch 1. End off. Stitch neck and chest seam, taking care to line up the stripes. 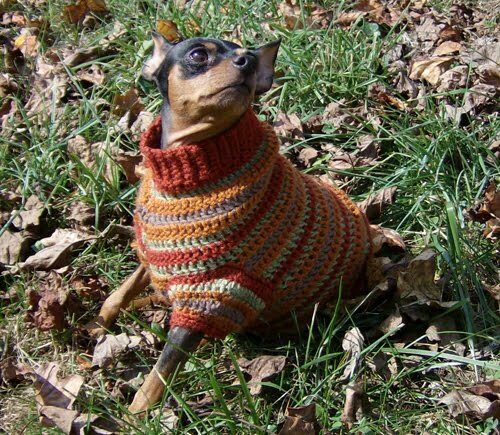 With MC and smaller hook, working from the inside of the sweater, join yarn to corner of leg hole closest to neck band and chest seam. Round 1: Make 13 sc in lower edge of hole, sc in each of 7 dc on left side of hole, 13 sc in upper edge of hole, sc in each of 7 dc on right side of hole. Join with ss to first sc. 40 sts. Ch 1. Round 2: Skip first sc, sc in next 12 sc, hdc in next 7 sc, dc in next 13 sc, hdc in last 7 sc, join with ss to first sc. 40 sts. Join color A. Ch 1. Round 3: Skip first sc, sc in next 12 sc, hdc2tog, hdc in next 5 hdc, dc2tog, dc in next 9 dc, dc2tog, hdc in next 5 hdc, hdc2tog, join with ss to first sc. 36 sts. Join color B. Ch 1. Round 4: Skip first sc, sc in next 12 sc, hdc2tog, hdc in next 4 hdc, dc2tog, dc in next 7 dc, dc2tog, hdc in next 4 hdc, hdc2tog, join with ss to first sc. 32 sts. Join color C. Ch 1. Round 5: Skip first sc, sc2tog, sc in next 9 st, sc2tog, hdc2tog, hdc in next 3 hdc, dc2tog, dc in next 5 dc, dc2tog, hdc in next 3 hdc, hdc2tog, join with ss to first sc. 26 sts. Join color B. Ch 1. Round 6: Skip first sc, sc2tog, sc in next 7 st, sc2tog, hdc2tog, hdc in next hdc, dc2tog, dc in next 3 dc, dc2tog, hdc in next hdc, hdc2tog, join with ss to first sc. 20 sts. Join MC. Ch 1. Round 7: Sc in each st around. Join with ss to first sc. Ch 1. Round 8: Sc in each sc around. Join with ss to first sc. End off. With MC and smaller hook, join yarn to edge of opening. Sc evenly around the opening and in each dc at the back hem. End off. Sew back ribbing to back hem. Weave in all ends.